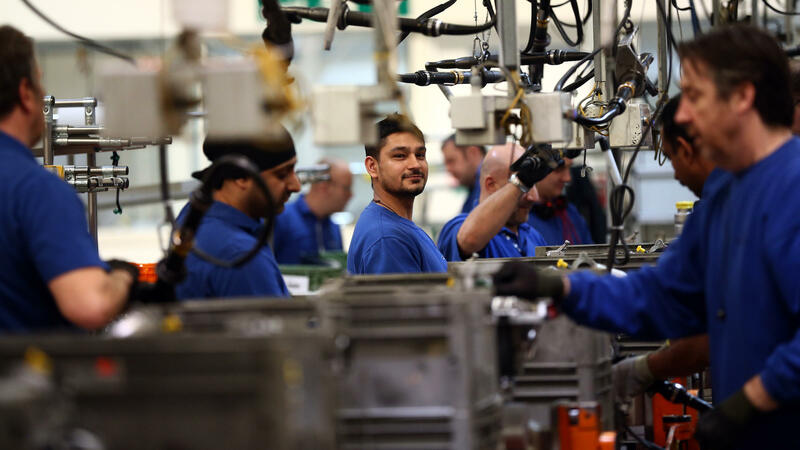 Employees work on an engine production line at a Ford factory in Dagenham, England. Many American firms based in the U.K. are concerned Brexit will adversely impact their businesses. The United Kingdom's planned split from the European Union is expected to take years, but it's already creating uncertainty for multinational companies operating in the U.K., including many American firms. Brexit also poses challenges to the U.S. government, as Washington ponders a future in which a key ally has less influence in Europe and likely becomes less relevant on the global stage. Even before the June referendum, American and other financial firms were looking beyond the City of London — the Wall Street-equivalent at the core of Britain's capital — for new office space in Europe. Meanwhile, U.S. automakers are anticipating sizable financial hits from the decision to leave the EU. "We see the impact on Ford of being somewhere in the range of $400 to $500 million each year," said Bob Shanks, Ford's chief financial officer, on an investor call earlier this summer. General Motors says it is cutting worker hours in German factories because it expects less demand for cars in Great Britain following the June Brexit vote. The car companies also worry that new tariffs could hurt the competitiveness of their U.K. factories. The U.K.'s auto business, which is seen as very successful, sends more than half of its exports to the EU. "It's vital for our U.K. automotive manufacturing, and for our huge retail market here that we secure unfettered access to European markets," says Tamzen Isacsson, director of communications with the Society of Motor Manufacturers and Traders, a U.K. industry group. If not, that could make it harder for auto plants in the U.K. to win future work. Plants routinely compete within companies for the opportunity to build new models, but because cars are built on five- to eight-year product plans, the June vote is not expected to have an immediate impact on which models are built there. "The big issues are going to be large-scale models coming up for renewal during the period of uncertainty," says Graham Armitage, an auto analyst for KPMG. For instance, if it costs 10 percent extra to export a car from the U.K. into Europe after Brexit, Armitage says that could make building some models in the U.K. unprofitable. "You're talking about tens of thousands of jobs that could be affected," Armitage says. "No one would say that all of those decisions will go against the U.K., but they're going to be tougher decisions than they would otherwise have been." The British auto industry does have something in its favor: The United Kingdom is an attractive export market. Germany sends about 800,000 cars a year to the U.K. and doesn't want retaliatory tariffs. Armitage says there are incentives for both sides to make a deal on market access. The outlook for the financial industry is a bit darker. Currently, firms in the City of London can freely offer a variety of financial services throughout the EU under what are called "passporting" rights. Many analysts expect at least some of those rights will disappear after Brexit. Even before the June vote, JPMorgan Chase & Co. chairman and CEO Jamie Dimon warned company workers in the U.K. that he might have to send some of their jobs to mainland Europe. "Today we can service EU companies here, freely — with systems, technology, research, investment banking," Dimon told employees at JPMorgan's office in the city of Bournemouth, on the English Channel. "After a Brexit, we cannot do it all here. And we will have to start planning for that. I don't know if it means 1,000 jobs, 2,000 jobs — it could be as many as 4,000." Andrew Gray, a partner with PricewaterhouseCoopers, which advises investment banks, insurance companies and other firms on Brexit planning, says some companies are considering moving some operations to EU cities ranging from Dublin and Amsterdam to Paris and Luxembourg. But he says such moves are hugely complicated, because London offers so many financial support services and already has a very talented labor pool. "A number of banks have estimated [that] to replicate even part of their infrastructure in Europe could take between five and 10 years," says Gray. "You have to be looking at real estate as an option," adds Gray, who says companies will have to look for areas with appropriate schools, housing and financial expertise. "There is only a finite supply of suitable real estate in a number of these locations." As for the U.S. government, Brexit is a deep disappointment. During a visit to London last spring, President Obama urged voters to cast their ballots in favor of staying in the EU — not just for economic reasons, but political as well. The U.S. traditionally has seen Great Britain as a valuable ally in many respects, including in pressing its interests with the EU. Washington also has struggled for years on an EU trade deal known as the Transatlantic Trade and Investment Partnership, which it hoped would bind the U.S. and its allies more closely. Anand Menon, a professor of European politics at Kings College, says a united Europe that shares democratic values is a valuable asset for the U.S. as it tries to deal with the rise and growing influence of an authoritarian China. "People in Washington will be slightly worried at the notion that a key ally like the United Kingdom is peeling itself off from the European bloc," says Menon. Menon, incidentally, doesn't think that's actually the case — but acknowledges that it's the perception. When the United Kingdom decided to pull out of the European Union, there were dire predictions about the impact on the economy. Since that vote a couple of months ago, the British economy has not completely crashed. But the pound has fallen against the dollar - one of the things that's creating uncertainty for American finance firms and automakers based in Europe. This week, we're hearing about America's role in the world in a project called A Nation Engaged. Today, we're going to explore how the Brexit referendum has affected U.S. business and political interests there. NPR's Frank Langfitt was on the line with us from London. Good morning. FRANK LANGFITT, BYLINE: Hey. Good morning, Renee. MONTAGNE: Well, let's start with the mood of American business in the U.K. these days. LANGFITT: You know, Renee, the actual Brexit is years off. But there are certain sectors here that are already anxious and bracing for it. GM is talking about cutting hours for workers at two German plants because of lower demand in the U.K. based just on the Brexit vote alone. Ford's talking about raising prices, even looking at closing factories. The company's already taking a financial hit. Now, this is Bob Shanks. He's the company's chief financial officer. Here's how he put it in an investor call earlier this summer. BOB SHANKS: We are expecting to have headwinds of about $200 million this year associated with Brexit, and we see the impact on Ford being somewhere in the range of 400 to 500 million dollars in each year. LANGFITT: And that's just based on the vote in June. MONTAGNE: And that is also just Detroit's view. There's also the view from London. It is Europe's financial capital. Lots of American investment banks are headquartered there. How do they see things? LANGFITT: Well, I've been talking to a lot of people on the future of finance in London, and we'll be hearing from them in a moment. But you can start even before the June referendum - what people were saying. Take Jamie Dimon - he's the CEO of JP Morgan. He came here and warned that after Brexit, the company's operation in the U.K. might not be able to do certain work in Europe, which is what most people expect. And he told workers in the U.K. office here that a lot of their jobs might actually end up going to continental Europe. JAMIE DIMON: Today, we can service EU companies here, freely, with systems, technology, research, investment banking. After a Brexit, we cannot do it all here. And we will have to start planning for that. I don't know if it means a thousand jobs, 2,000 jobs. It could be as many as 4,000. ANDREW GRAY: This is hugely too complicated because the organizations have evolved in London over decades. LANGFITT: Andrew Gray is a partner with PricewaterhouseCoopers. He advises investment banks, insurance companies and other firms on Brexit planning. GRAY: A number of banks have estimated to replicate even part of their infrastructure in Europe could take between five and 10 years. LANGFITT: So you mean to take what they do here in the city of - in London and move it to Europe? GRAY: It's a huge amount of time. There are 2 million people working in financial services in the U.K. There is no capacity in a number of other European locations simply to replicate what we have. LANGFITT: Gray says companies are considering cities ranging from Dublin to Amsterdam to Paris and Luxembourg, assuming they can find the space. GRAY: You have to be looking at real estate as an option. Yeah, there is a - only a finite supply of suitable real estate in a number of these locations. And if they choose a particular location, they've got to think about issues around - you know, the people issues, which will include some of the social aspects, housing, schools. They've got to look at language skills. LANGFITT: The United Kingdom's auto business, which is seen as very successful, sends more than half its exports to the European Union. So naturally, it's worried, as well. TAMZEN ISACSSON: It's our single most important trading partner. LANGFITT: Tamzen Isacsson works for the Society of Motor Manufacturers and Traders, a U.K. industry group. ISACSSON: It's vital for our U.K. automotive manufacturing and for our, you know, huge retail market here that we secure unfettered access to the European markets. LANGFITT: Otherwise, companies, such as GM, could face tariffs to export to the EU. And that could make it harder for plants here to win new work. GRAY: The big issues are going to be large-scale models coming up for renewal during the period of uncertainty. LANGFITT: Graham Armitage is an auto analyst for KPMG. GRAHAM ARMITAGE: You're talking about tens of thousands of jobs that could be affected. You know, not all of those under - no one would say that all of those decisions will go against the U.K., but they're going to be tougher decisions than they would otherwise have been. MONTAGNE: So American business is anxious, uncertain about Brexit. Where is the U.S. government in all of this? LANGFITT: Well, you know, you remember, President Obama actually came here, and he urged the British to vote, stay in the EU. And it wasn't just for economic reasons, but political ones as well. And it is all connected. The U.K. has been seen as a reliable, influential ally for the U.S. on its own and in Europe. And I was talking to a guy named Anand Menon. He's a professor of European politics at King's College here in London, and this is the way he analyzed it. ANAND MENON: First and foremost, I think the United States wants a cohesive Europe. This obviously - this Brexit decision - undermines that cohesiveness to an extent. The United States wants an economically strong Europe, and in so far as Brexit has negative economic consequences for the U.K. and for continental Europe. That's not something the United States would welcome. MONTAGNE: All of that explains why the U.S. really wanted the U.K. to stay in the EU, right? LANGFITT: Absolutely. I mean, the U.K. has been very helpful to American interests in Europe and speaking for the United States on the continent. But this guy, professor Menon at King's College - he said more broadly that it was about a united Europe and that a united Europe with the U.K. - in it was a key to manage the influence of China - rising China. You know, the U.S., the U.K., Europe - they all shared democratic systems and values. And people see it as important for these countries to stick together as an authoritarian nation, as exerting more power across the globe. And with Brexit, you know, managing China's rise may make it just a little bit harder for the U.S.
MONTAGNE: That's NPR's Frank Langfitt speaking to us from London, as part of our series A Nation Engaged. Transcript provided by NPR, Copyright NPR.